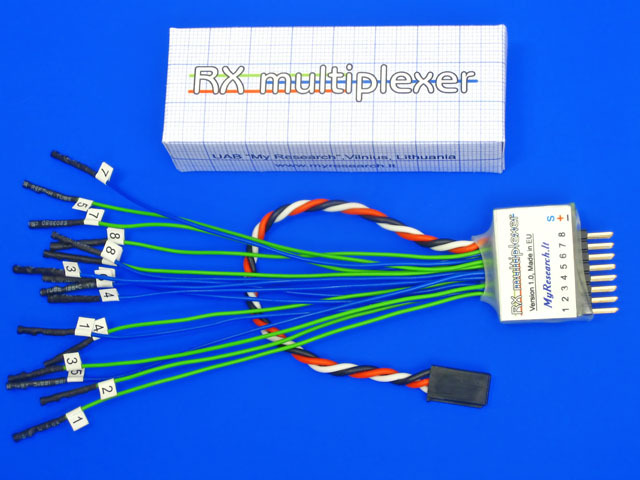 RX Multiplexer ensures reliable control of a model in two communication channels. It is usable in long-distance flights or in case of control from two different points. The device enables a manual or automatic switching of control between two on-board receivers. Using two different bands of communications ensures reliable control of a model both in the limits of direct visibility and in case of existence of obstacles. The number of commutated channels is 8 plus one channel for controlling the device. For increasing a reliability of the control system, two on-board receivers are installed, so if one receiver loses communication, control function will be automatically switched to the second receiver. Two identical receivers can be installed; however, using two communication channels with different frequency ranges is more rational. If a model is launched over a town or in proximity of a radio transmitting station or a zone under protection, there will be a high risk of appearance of both random and conscious interference. Interference may cause a disruption of communication in single range of frequencies; however, a probability of simultaneous appearance of interference in different frequency ranges is low. A majority of transmitters are equipped with replaceable frequency modules. Usually, connecting a single module is provided on the control board; however, you can connect two modules simultaneously on your own. The 2.4 GHz communication channel ensures a reliable communication in the limits of direct visibility; however, on controlling a model according to the image from the on-board camera, you can get out from the zone of direct visibility and in such a case, using of frequencies 27 MHz, 35 MHz, 40 MHz and 72 MHz will be more reasonable. The recommended version: please, acquire a control board with the frequency 72 MHz and a supplemental module for the frequency 2.4 GHz to be connected by a cut-in connection "Trainer". If you have bought a module to be installed instead of a former high-frequency module, it should be connected in parallel with contacts of the first module: GND, VCC and Signal (i.e. in parallel with all contacts, except of the antenna's contact). Transmitter of higher power connected to the control board can be used as well. Sometimes a necessity of a flight above a location where neither climbing not landing is possible arises. In such a case, two on-board receivers and RX Multiplexer device are used. The first pilot controls climbing and directs the model towards the zone controlled by the second pilot. When the second pilot is ready to accept controlling the model, the first pilot switches control to the second receiver. When the second pilot completes the programme of the flight, he directs the model towards the point of landing and informs the first pilot by a phone on a necessity of accepting the control by the latter. The device is equipped with eight inputs for signals from the first receiver (green wires) and eight inputs for signals from the second receiver (blue wires). Servomechanisms are connected to eight outputs of the device. It is not required to use all inputs and outputs. One channel of the first receiver is used for controlling the device. If the value of the control signal is 100% (the duration of the control pulse is 1.7-2.1 ms), controlling through the first receiver takes place. If the value of the signal is another, controlling through the second receiver takes place. Flashing LED indicated activation of the first receiver. Do not forget to programme the inverse value of signal for "Fail safe" mode.